After one more cool morning, temperatures will begin to moderate. In addition, we will turn forecast focus to the possibility of strong storms. Today and Tonight: All blue sky and sunshine is ahead for your Tuesday. A significant warmup is anticipated for the afternoon, adding about 30 degrees from the morning low and approaching 70 degrees for a high. Overnight will stay clear with a low in the mid 40s. Up Next: Winds will shift southeasterly on Wednesday allowing some moisture and warmer temperatures to sneak back into the atmosphere. All the while, another mostly sunny day is expected with highs back into the 70s. The dry spell will end there, as a storm system will come into the area Thursday. Showers are likely and some ingredients will be present to support heavy rain and strong thunderstorms as well. While the window for severe weather appears small and confined to midday, a longer duration of rain could spell 1-3” across the area. While it has been dry lately, runoff may not be an issue, but as you know, a lot at once could lead to street and poor drainage flooding. Stay tuned as our team hones in on specifics. After arrival, this system will stall, keeping showers in the forecast through Saturday until the next front comes into play later in the weekend. Highs in the 80s look likely Saturday, well into next week. 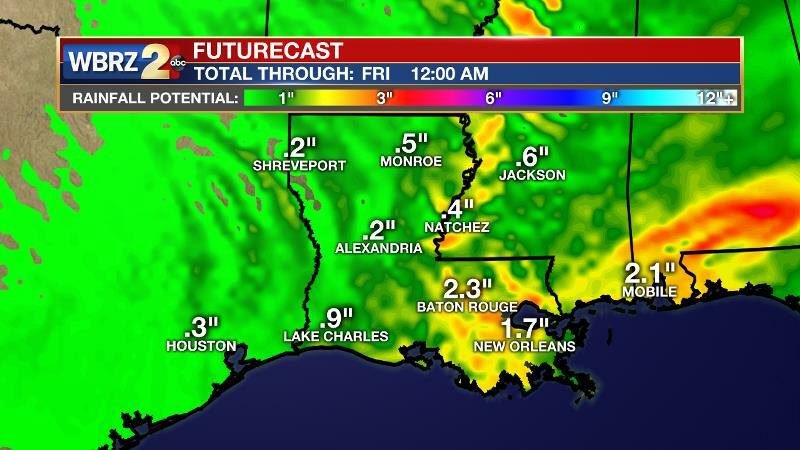 The Mississippi River: At Baton Rouge, major flood stage continues with a level of 43.1’ as of Tuesday morning. Peaking at 44.1’ on March 19, the river set its 7th highest recorded crest at Baton Rouge. In addition, at 87 days this is now the 4th longest period above flood stage. Due to river flooding and drainage north of the area, runoff will keep the river high for many days to come. The high water is primarily an issue for river traffic and river islands, although some inundation will continue unprotected low-lying areas. Agricultural operations will be impacted on the west side of the river. The grounds of the older part of Louisiana State University's campus become soggy. This includes the area around the Veterinary Medicine building, the Veterinary Medicine Annex, the stadium and ball fields. The city of Baton Rouge and the main LSU campus are protected by levees up to 47 feet. Some seepage may be noted due to the long duration of high water placing pressure on the levees. Water from the extensive Missouri River flooding across the Upper Midwest will not reach Baton Rouge until April and the Mississippi River is expected to have fallen some by that time. As some of the Mississippi River diverts into the Atchafalaya River, gauges at Krotz Springs and Morgan City will stay high as well. Like Big Muddy, this is expected to be a prolonged event but is not uncommon for the time of year. Read more HERE. A surface high pressure system will promote diverging surface winds and subsiding air leading to an all clear Tuesday with a fast warmup from a chilly morning. By Wednesday afternoon, the high will shift east and onshore flow will commence. Moisture will build ahead of a cold front set to enter the region on Thursday. First, enough instability and spin will be available that as a front provides lift, there will be a possibility of severe thunderstorms, especially north of I-10. At this time, unidirectional low to mid-level winds would be supportive of a broken line or cluster of storms. 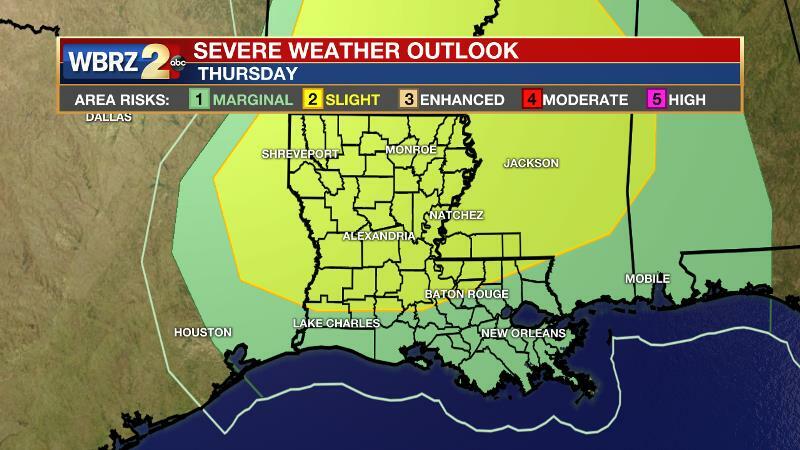 The Storm Prediction Center has outlined areas north of I-10 in a 2 out of 5 “slight risk” for severe weather. The overlap of favorable instability and shear appears to be during the middle of the day Thursday, setting that as the most likely time for strong storms. Second, above average moisture content in onshore flow lifted by an upper level impulse ahead of the front will lead to a longer duration of high rain chances. 1-3 inches of precipitation is likely across the area on Thursday. The front will stall along the coast, leaving the possibility of showers around on Friday and Saturday. The decaying boundary will need assistance from weak, upper level disturbances to set off rounds of showers, so washouts are not in the cards those days, but shower dodging will be. Another upper trough will follow over the weekend brining rain chances back up by Sunday. High temperatures will ease into the 80s toward the end of the forecast period and there are signs that they will stick around well into next week and likely beyond.